West Leeds v Brods Rob Jennings. 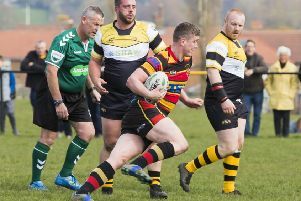 Old Brodleians were stunned by West Leeds’ opening salvo and were beaten 32-19 in Yorkshire One on Saturday. The fourth-placed hosts scored four tries in the opening quarter against their second-placed visitors on the way to avenging a 17-11 defeat at Woodhead in September. West Leeds were clearly fired up whilst the Brods appeared strangely subdued at the kick off. The home team have plenty of pace and this was apparent in the early exchanges as they dominated possession and took the game to their visitors. In the seventh minute West Leeds forced a lineout on the Brods’ line and from the resulting melee a second-row forward seized possession and forced his way over. The try was converted. The Leeds side were quickly back on the attack and their centre picked up from a ruck, broke clear and beat some poor defence by the Brods to race to the line for a second try, this time unconverted. Things went from bad to worse for Brods when the home fly-half showed great pace and deceptive footwork to break clear from the rear of a maul and race to the line. He converted to make it 19-0 after 15 minutes. Brods were in a state of shock and defensive errors led to a fourth try from a kick and chase. That meant West Leeds had a 26-0 lead and a try scoring bonus point in the bag after just 20 minutes. The visitors finally enjoyed a sustained period of possession and worked their way into the home 22. Good rugby, with some strong running by Phil Town and Rob Jennings and support play by Jonny Cole and Michael Briggs, put Brods on the attack and Benny Pritchett finished in fine style. Tom Breakwell converted and Brods’ confidence was growing. Tom Wilson went close in the corner and from a series of lineouts on the West Leeds line, Brods were unlucky not to score. On the stroke of half time Bob Sykes was just short in the corner and Brods had a mountain to climb trailing 26-7. The Hipperholme boys enjoyed a territorial advantage and dominated possession at the start of the second period. Brods lost possession following a lineout near the West Leeds line but the offensive continued and the introduction of Nathan Scott led to further penetration in midfield. After 15 minutes of pressure, Brods got their reward when Scott broke blind and, having juggled the ball on receipt, dived over in the corner for a fine try. Brods continued to dominate but with 20 minutes to go Pritchett was injured and Brods conceded a penalty which Leeds converted. The home side made the game safe with a further penalty but Brods didn’t give up and scored the best try of the game when Matty Hoyle broke from deep to feed Town and the young centre’s pace and power took him clear of the defence to touch down.